Angle Pond Woods is a 55+ community in Hampstead, New Hampshire. With just 116 attached homes, this charming active adult neighborhood will provide a quiet and welcoming atmosphere where neighbors become fast friends. Residents enjoy this 90-acre development that consists of mature trees and scenic landscapes in a wooded setting. Homeowners will have outdoors amenities and waterfront access that will keep them active and busy any day of the week. Located in Hampstead, NH, residents will be within close proximity to shopping, dining, and recreation. Active adult homebuyers will love the serene environment and natural beauty in Angle Pond Woods. Although Angle Pond Woods does not have a clubhouse, it does provide great outdoor amenities that residents can use. The outdoor patio is the perfect place to hang out with friends. It also has a gazebo and designated picnic area where homeowners can socialize with neighbors for BBQs, casual parties, events, or just enjoy the outdoor scenery. They can also take advantage of the neighborhood's walking and biking trails to appreciate the natural beauty that surrounds them. Waterfront access is convenient with a scenic pond where residents can dabble in the water on a hot day or launch their kayak or canoe. In Angle Pond Woods, homeowners worry less about mowing the lawn and instead have more time to set up their own activities and hobbies. Active adults enjoy a maintenance-free lifestyle because a homeowners' association fee takes care of yard work. Angle Pond Woods was developed by Lewis Builders between 2005 and 2010. This 55+ community consists of 116 attached homes available on a resale-only basis. Active adult homebuyers can find low-maintenance ranch-style homes in Angle Pond Woods. These attached homes offer approximately 1,500 to 1,900 square feet and have one to two bedrooms, one to three bathrooms, and an attached one or two-car garage. They feature open layouts with fireplaces, GE appliances, hardwood floors, eat-in kitchens, cathedral ceilings, plenty of closet space, and large basements. Angle Pond Woods is conveniently located just a few minutes away from Route 111 in Hampstead, NH, which makes driving around town a breeze. Residents have access to Shoppers Village Shopping Center, Walgreens, Dunkin' Donuts, Hannaford Supermarket, and other restaurants. Plenty of outdoor recreation is nearby as well such as the Angle Pond Campground, Sunset Park Campground, and Crowell Country Club. The community is 30 minutes away from Manchester and about an hour away from White Mountain National Forest. For big-city entertainment and attractions, Boston is about an hour's drive away. When traveling farther is necessary, Portsmouth International Airport at Pease is about 40 minutes away. 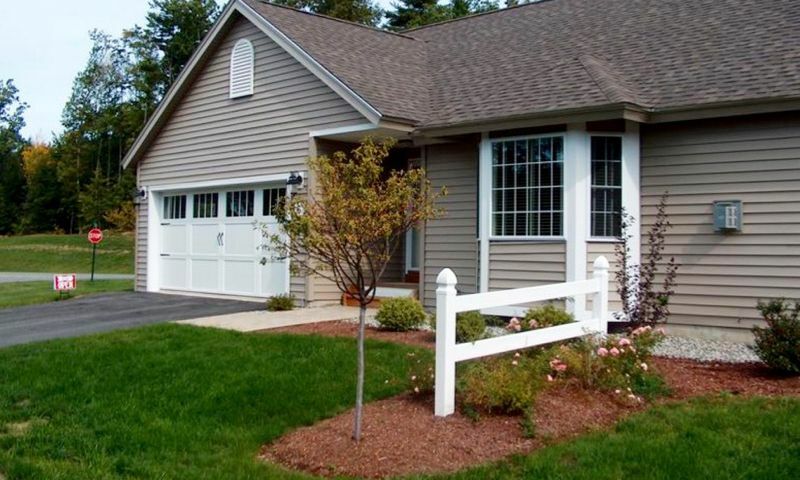 Angle Pond Woods is the ideal retirement destination that provides a quiet oasis for active adult homebuyers in Southern New Hampshire. There are plenty of activities available in Angle Pond Woods. Here is a sample of some of the clubs, activities and classes offered here. Active adult homebuyers can find low-maintenance ranch-style homes in Angle Pond Woods. These attached homes offer approximately 1,500 to 1,900 square feet and have one to two bedrooms, one to three bathrooms, and an attached one or two-car garage. These homes feature open layouts with fireplaces, GE appliances, hardwood floors, eat-in kitchens, cathedral ceilings, plenty of closet space, and large basements. Please Note: Floor plans are not available at this time. 55places.com is not affiliated with the developer(s) or homeowners association of Angle Pond Woods. The information you submit is distributed to a 55places.com Partner Agent, who is a licensed real estate agent. The information regarding Angle Pond Woods has not been verified or approved by the developer or homeowners association. Please verify all information prior to purchasing. 55places.com is not responsible for any errors regarding the information displayed on this website.